Looking back, I felt relaxed, despite all the things that kept us active. We did a lot, and I was exuberantly exhausted! No matter what we were doing in Wisconsin, it fell under one of two categories. Our bodies were either in motion or not, and we participated in enough movement so that we craved and needed time to rest and recover. My middle daughter, who cannot sit still in a chair, EVER, sat quietly at breakfast, lunch, and dinner every day. 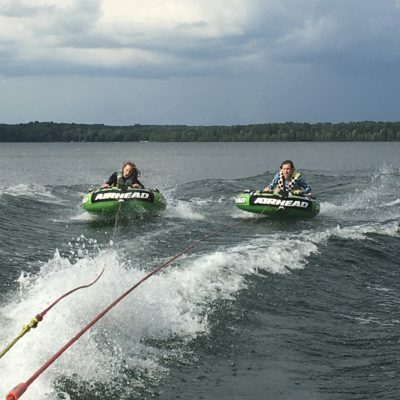 But, first, it took more than three hours of riding in a speedboat or being dragged behind it on an “Airhead” tube bouncing, flying, and crashing into the water to quench her movement thirst. Finally, her movement needs were satiated. And, then, she was at rest. She learned to be still by moving enough! It was an eye-opening experience. My daughter doesn’t have a sitting still problem; she has a moving problem. I understood this at an intellectual level, as it is my job to understand this, but it was a slap in the face to witness it first hand in my daughter. I thought I gave her enough movement opportunities at home. But, she needs more. For the first time, I saw how much and how intense it had to be to satiate her need. Now that I know, my challenge is to recreate the time and intensity on land, where we don’t have access to speed boats and flying rubber rafts! Whether we like it or not, we all fall into this category with movement: not enough time or intensity. Our technology-driven culture is increasingly sedentary. Our over-scheduled days, our packed to-do lists, and the responsibilities we “must” attend to eat into our movement time. And without the right amount of movement, rest is not the recovery period it’s supposed to be. It’s restless. But, we can start today to change this trend for ourselves and future generations. We can start right now with our babies. We can build the healthy habit of moving enough by doing it, every day. “Enough” is not dictated by the American Academy of Pediatrics, nor defined by US government lowest common denominator standards. “Enough” is individual. We get to take our little one’s lead, allowing, observing and joining in. Let them move uninhibited on the ground, on you, inside, outside, on grass, dirt, and sand, up and down hills, negotiating natural and manufactured obstacles and interacting with loose things. Follow their lead and join them in their world. If you can’t think of a game, just start by imitating them. We are ALL creative and can come up with play activities if we just let ourselves join in the movement. How often have you stopped yourself from playing with your little one during moving time? Next time, get over that mental hurdle and just go! You might feel too tired to start, but once you do, that fatigue takes a back seat. Just go! Our babies’ bodies and brains depend on sufficient movement and rest for optimal growth. Rest and recovery do not happen unless your little one moves enough. And, if your baby does not seem to be moving enough, it’s important to dive deeper into why. Moving enough is a simple concept, but much harder to implement consistently. It takes vision and dedication. It’s more than interest. It’s commitment…for the long haul. We are fighting an uphill battle with our sedentary culture swallowing us whole. It’s time to start our movement for enough movement, one day at a time. Who’s in? I’d love to help you get started. Book a time with me to strategize how to get more fun, healthy and consistent movement in your days, starting today and lasting a lifetime! This can’t wait. The time to go is now! Book a FREE 30-minute call with me so we can get you and your family going!